As a manufacturer of hydraulic cylinders, we specialize in the industrial tie-rod design – both the standard NFPA interchangeable tie-rod design and the custom design. We offer our hydraulic cylinders in the medium duty pressure range (pressure-rated per bore size) and the high pressure range. 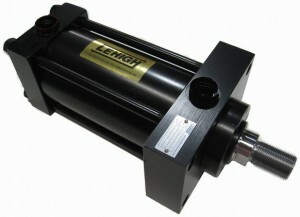 In designing the HP Series high pressure hydraulic cylinders, Lehigh has developed a product that is rugged, reliable and the perfect balance of design, material and precision workmanship. HP cylinders can be designed for spring extend and retract, configured for all types of hydraulic fluids including water and with many sensing options including tie rod mounted limit switches up to 4″ bore. Seal options are available for low friction applications, servo applications, fluid pump applications, redundant rod seals with gland drain.